The Holy Father’s words are a strong reminder of what our faith teaches, which is why I am saddened by the recent headlines concerning immigration. So much of what I’m reading and hearing isn’t consistent with the pope’s message and with our country’s long history of welcoming immigrants and refugees. I was shocked by the news that our government was separating children from families coming here to escape extreme poverty, violence or persecution in their homelands. Steps must continue to reunite them as quickly as possible. Families are a foundational element of our society, and immigration policies should never tear apart or destabilize them, particularly when they are most vulnerable. Additionally, establishing so-called zero-tolerance policies, building border walls and ending family-based migration will harm, rather than help, individuals and families in need. Also, currently, our lawmakers continue to debate the future of Dreamers — young people who were brought to this country by undocumented parents. We need to find a way for Dreamers to obtain full lawful permanent residency and eventual citizenship. The United States is the only home most of these young people have ever known, and they contribute in so many positive ways to our parishes and communities. They should be able to access an education and build a better future for themselves and serve their communities without the fear of being deported. You may wonder why the Church advocates so strongly for the care of immigrants and refugees. It’s because their plight is so rooted in our history and identity. After fleeing from Egypt, the Israelites wandered the desert for 40 years in search of the Promised Land. God didn’t want them to forget this experience, reminding them of the importance of caring for refugees: “You shall treat the alien who resides with you no differently than the natives born among you; have the same love for him as for yourself; for you too were once aliens in the land of Egypt” (Leviticus 19:33-34). The Holy Family also lived as refugees for a time after they were forced to flee Egypt because of the threat of violence. Jesus reminds us that we will be judged in part by how we care for the stranger: “For I was hungry and you gave me food, I was thirsty and you gave me drink, a stranger and you welcomed me …” (Matthew 25:35). At the heart of the Church’s teaching on this issue is respect for human life and every person’s God-given dignity. This doesn’t mean we shouldn’t regulate our borders or control the flow of immigration. But it must always be done with compassion and respect for human life and every person’s God-given human dignity. Immigrants and refugees aren’t “invaders” whom we should fear, and they aren’t here to take something away from us. The vast majority are leaving their homelands in search of safety and to meet basic needs. They are coming here — like most of our ancestors did — to start anew and share their lives and gifts with our communities. Our faith calls us to respond to this in the spirit of our diocesan mission statement: with a heart of mercy, voice of hope and hands of justice. 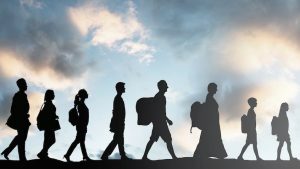 I ask every Catholic in the Diocese of Saint Cloud and every person of good will to join me in responding to Pope Francis’ World Refugee Day messages by working to create communities of hospitality and welcome for immigrants and refugees. Please be an advocate on this issue whenever and wherever you can, working with your parish’s social concerns team and urging your elected officials to support comprehensive immigration reform measures that are fair and just for everyone. And continue to pray for peace in our world, for the end to the situations that cause people to flee their homes, and for the people of our diocese, so that we may always be the face of Christ to every person in need.